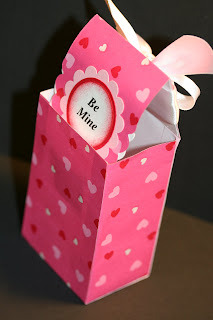 Then the second thing I showed using the same bag die was a Valentine's Day box. Just click on the links to view either one of them. As with all of the photos on my blog, just click on them for a closer view of the images. I ran that chipboard through the Sizzix using the bag die. Before you do this you want to make sure that the side you are going to have showing is the side you have face up on the die. You don't want the score marks on the side pieces to show on the outside of your box. 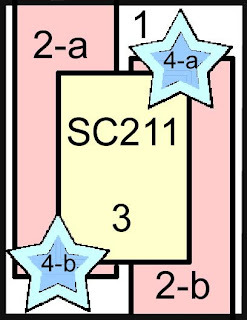 You will not be folding those score marks in so if they don't come out on the chipboard it's no big deal. Once you have the pieces cut out you are going to be marking and cutting them down. Using your paper cutter, insert the straight end of the long strip (not the scallop end) in and cut off 1-7/8". The next score mark that the die made you keep along with the following one. You will score the next line at 1-7/8" from the second score line from the straight edge. And your final score will be at 1-5/8" from the score line you just made. Next to the newest score line you will see the original score line the die made. DO NOT fold it or it will show on the outside. Fold the one you just made. Now you have two choices here. You can either keep the scallop on and work with it, decorating it and probably taping it, gluing it or using a magnet to keep it in place. Or you can cut it off at that original score line. I chose to cut my scallop off and decorate the front of my box. Set it aside. Now pick up your side panels and cut 2-1/4 off the top of it and then score at 1/4" from the newly cut edge. Fold in the side and bottom scored lines only. Also fold the scored areas in on the long panel, except for the one closest to the scallop if you are keeping the scallop. If you want to add a window to your box, now is the time to do it. Once you start attaching the sides it is almost impossible to add it. I would also recommend adding the acetate piece as well. Or you can leave it open depending on what you are putting inside. To assemble, begin with the bottom flap of the side pieces. I used Aleen's Tacky glue to affix mine. I wanted something that would hold quickly and hold well. Mostly I was going for the quickly thing. Most liquid glues hold well!! 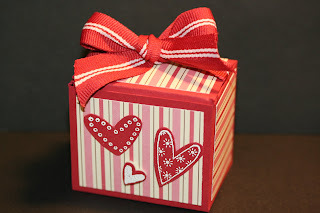 Tomorrow I will show you one more way to get the most out of this Sizzix die!! Thank You for Someone Special! I made this thank you card for my friend Ann. She is SO good to me. She is SO sweet and SO kind. She is a wonderful friend. She is the kind of person you meet and you know you want her for your friend. She is the one who gave me the wonderful birthday card that I posted a few days ago. She had made it using Versa Mark and chalks. SO I thought I would give the technique a try. Well, the next time Ann comes over to stamp I think she will be giving me a lesson on this technique. Mine didn't turn out quite as subtle as hers did. And I will get this secret information out of her!!! LOL I do have to confess that I had never done that chalk technique before and it is on my list for the technique pages. I hope by the time I get around to making that page I am better at it!!! It's NOT Fun Being Sick! A friend of mine was not feeling well so I thought I would make her a get well card. It's NOT fun being sick but it is fun to get cards from those who care about you letting you know they are thinking of you. 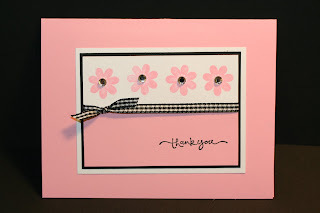 This was a fun card to make and I REALLY do LOVE the Stampin' Up! "Fun & Fast Notes set." It covers quite a few occasions. I like sets that I can get a lot of use from. 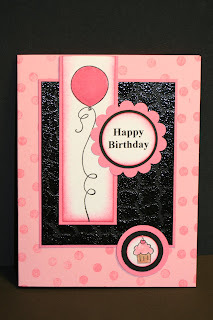 I used the Pink Pirouette, Basic Black and Whisper White card stock. I colored in the image with markers and added yellow brads to the center of the flowers. I added the strip of ribbon and tied on 3 bows. One just didn't seem to look quite right. Oh and I used the Bella Rose decorative paper. 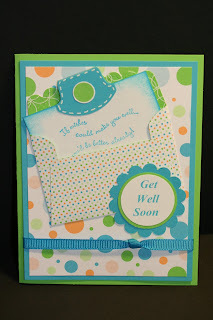 That design was such a soft subtle one that was perfect for a get well card!!! 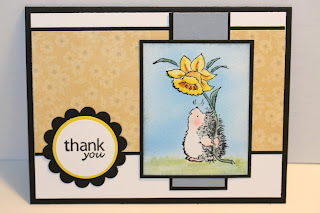 Here is my card for the Sketch Challenge over at SplitCoastStampers. Each week I look forward to these sketches and I am thrilled when I am able to find a few moments to play. Though it tends to get to be late when I find the time but one day a week with little sleep isn't too bad, is it?? It's SO worth it!!! I needed another thank you card. I was going to make this into a "welcome spring" type card but I really didn't have any use for one but I did REALLY need another thank you card. I used a Penny Black stamp. It's called "Seeing Your Face" and the words were done using the Stampin' Up! "Holiday Blitz." Now that's another set that I get a lot of use out of. It covers MANY different occasions. 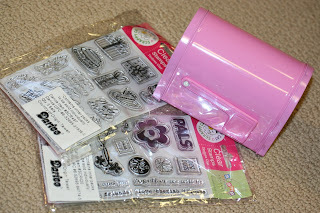 The decorative paper is some retired stuff I had by Stampin' Up! It's always fun when you can use up some of those old papers!!! I did use the air brush for the sky. It's a lot easier than coloring it in by hand. I LOVE it when I can play with that toy too. It's too bad our son didn't want to take it with him when he moved. We bought it when he was in high school because he was very interested in it but he never used it. SO I get to use it until he wants it back and I hope that isn't too soon!!! So here is the card I have ready for a friend of mine. It will go out in the mail tomorrow. She doesn't have Internet (I know she is one of the few people I know who doesn't have it) so I don't have to worry about her seeing the card here before it gets to her in the mail!!! She's such an animal lover and I know she's going to like this cute little guy!!! I have received this award from several fellow bloggers. I am saying this from the bottom of my heart that I do appreciate the award but I am unable to play along at the moment. This is a VERY fun technique too and it's not difficult to do either!!! Take your cotton ball and using the rubbing alcohol, wet the watercolor paper. You want it wet but not sopping. Take your craft knife and a watercolor crayon and scrap the knife across the crayon allowing the shavings to fall onto the wet watercolor paper. You do not want chunks of the crayon, just thin shavings. You can use as many or as few colors of crayon as you wish. When the background is as you like it then set it aside to dry. To speed up drying time you can heat dry the paper. You can tell the crayon is dry because it won’t be shiny anymore. Use it as a background or stamp directly on it. See, not that difficult to do, is it?? Here is the Valentine's Day card I think I'm going to give my hubby!!! We usually don't exchange cards but I am thinking this year I may pamper him a bit. He's been SO good to me and ever SO supportive of me and my quirky ways!!! Personally I wouldn't tolerate it!!! LOL SO this year I'm planning a few fun surprises for him. Yes, including meatloaf. Probably not in a heart shape. I prefer to not to have to touch the meat much so forming it in a heart wouldn't be on the agenda!!! But hey, it's still meatloaf and he will LOVE it!!! Now what I want you to check out on this card is the background!!! I call it "Confetti Background." It's a new technique that I came up with and thought you should see it in "action!" Tomorrow I will be posting the technique page for the next set of 20 pages and the instructions for you to give this a try too!! It is really very easy and fun to do!!! 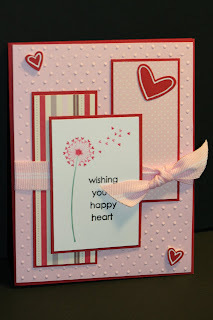 The colors I used on this card are Pretty in Pink, Pink Pirouette, Rose Red, Whisper White and Watercolor paper. I added some dots with the white gel pen and some paper piercing in the corners of the stamped image. The heart inside the "Love" is raised up on a Dimensional. The little flower is punched out and added to the white card stock using a brad. I tied on a bow and then taped it all together. It was fun to make, especially that background!!!! 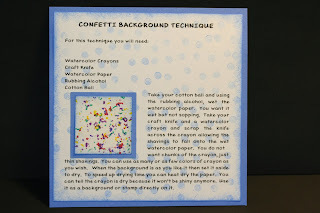 Stay tuned tomorrow to learn how to make your own "Confetti Background!" Sara over at "Sara's Creative Adventures" made this new header for me. She's not only a talented stamper but is wonderful at making blog headers too!!! I just LOVE it!!! Didn't she do a fabulous job. If you want one you'll have to discuss the details with her... designs, size, price, etc. It's so fun to have a unique looking blog!!! I would LOVE to learn how to do these but I just don't have any spare time to learn something like this right now. While you are at Sara's blog take a look at her beautiful creations, you won't be disappointed!!!! Here are a few cards that were made by a couple of great gals that come to my home to stamp once a month. They are such creative people. Thank you Ann and Leah for allowing me to share your creations with this fabulous stamping community!!! 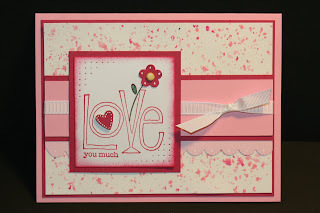 Ann made the cute "Love" card using the Stampin' Up! 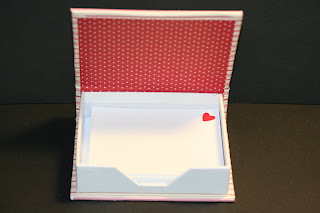 "Love You Much" set and the Dotted Swiss Cuttlebug folder. Didn't it turn out cute??? It's such a sweet, simple and clean looking card. And Leah made the one with the heart from "Doodle That" set and yes, I still h ave that set. I just LOVE it and am not ready to part with it yet. As long as there is room on the shelves for them I will keep them!!! The layout Leah used is one of my favorites. I especially LOVE it because you can use a small stamp that normally you would find difficult to work with. And you don't have to use a lot of layers to build up the card to accommodate the small stamp. Isn't this card adorable??? And the last card was the birthday card that Ann made for me. I was just in awe of it. She used Versa Mark on the image and chalked in the colors. Isn't it just wonderful??? It's so soft and sweet looking. 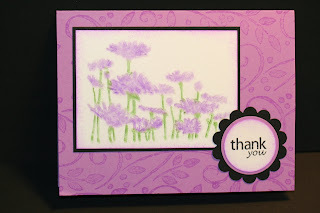 The image is from the Stampin' Up! "Upsy Daisy" set. One I have not had much time to play with myself. But I'm hoping to get some time to play with them next week. Hubby is such a chocolate freak!!! 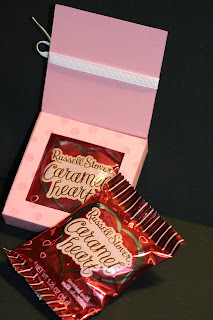 SO while I was out shopping the other day I saw these Russell Stover Caramel hearts and I bought them just for a project like this. At the time I bought them I didn't have this die but once it arrived at my front door I knew what my first project with it would be!!! Now a bit about this box. I cut a piece of 12" x 12" card stock in half. I ran the half through the Big Shot with the Shaker Box die and it comes out all scored and ready to put together. Even the window is in it!!! You just have to stamp on it, add a piece of acetate and put it all together. I u sed the Stampin' Up! wheel "Spunky Spots". It's one of the simpler dies I have worked with. There were no pieces to assemble. It comes out of the machine ready to use!!! This one was a LOT of fun and I can see myself getting a LOT of use out of it, especially for craft fairs this fall. Of course I'll be sure to show you what I make with it for the craft fairs!!! In the new Stampin' Up! catalog there is a new die cut for the Sizzix Big Shot!!! It's the "Bag with Scallops" on page 195. I made a bag using it. Click here to see it. I took a piece of decorative paper. Cute paper isn't it?? I got it at Target in the Dollar Spot and let me tell you, you REALLY get what you pay for. This paper is SO thin and very difficult to work with because of that. Stampin' Up! has such quality decorative paper. It's thick enough to hold a shape and it's double-sided!! But I had to use this paper because it was chosen by someone special and they wanted me to make them something with it. 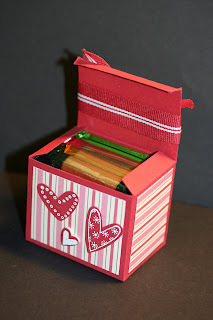 SO I came up with this fun box to fill full of Valentine's Day candy!!! I did use the bag punch believe it or not!!! And here is how I did it. I took the paper and cut it so it was 6" x 12". I ran it through the Big Shot with the "Bag with Scallops" die. Then I took the other piece of paper and I cut it so it measured 3" x 12". I ran the piece through the Big Shot using the same die but I only cut out one more piece that had the scallop on it. I didn't need any more side pieces. Now here is the tricky part!!! I folded the scallop piece at 2-3/4" from the scallop. Then I folded it again at 1-11/16" from the last fold. And the final fold was at 3-3/4" from the last fold. What was left goes on the bottom of the box. You may have to trim a little off the end, you don't want it hanging out the front of the box. When I assembled the box I taped the newly folded piece to the scallop piece. The original scallop is hidden under the top part of the lid. You will see this once you fold the box. I did take a piece of card stock and cut it to fit and taped it to hide that inside scallop. For the sides I just folded the edges in and the bottom piece in and taped them in place. To help in taping them you want to tape the bottom flaps on first and then either the front or the backs on. You don't want to tape a right side and then a left side. It can get off kilter doing that. It's best to tape fronts and backs. Once the sides were put on the bag now formed a box just by adding that extra scalloped piece and folding it in the right places!!! For that little white scallop edge I just took a piece of white card stock and put it on the die and ran it through. I only needed the scallop so my piece of card stock was not very big. I used the scallop punch and made a pink scallop. 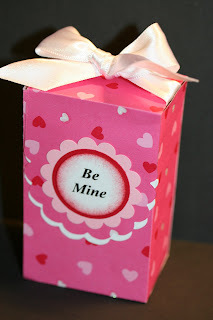 I used the 1-3/8" circle punch and made a Real Red circle and the words "Be Mine" I did on the computer and punched them out using the 1-1/4" punch. I sponged the edges and then taped it together. I tied a bow at the top and it was ready to fill with candies!!! 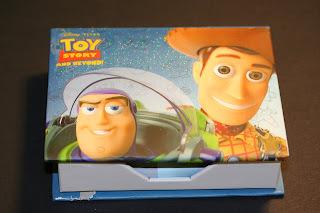 If you wanted to add a window in the box you would have to make the flap shorter and you would punch the window in before you tape the box together. So now I have a die cut that I can use for boxes or bags!!! Dual purpose!!! Gotta LOVE that!!! As I was coming in the garage today I saw this bag of wild birdseed. It was just sitting there minding it's own business!!! You see where this is going?? LOL Since the city cut down all the trees in our backyard there is no where to hang the bird feeder thus the bag of seed in the garage. Now we do have trees in the front yard but no feeders on them. But come spring that will change!! Anyway..... After seeing the seeds this stamp came to mind!! I thought it would be fun to make a shaker card using bird seed. I did have to double up on the Dimensionals behind the card stock. A single layer was just too thin and the seeds would bulge on the acetate, they were just not free enough to move around. There is one thing I would have done differently and probably will change now that I see the card on the computer. It's the hat. I think it needs something at the top. I could punch out a small circle or I could hunt down a tiny pom pom. I think I'll punch a circle, it would be SO much quicker than digging in the mounds of craft "stuff" I have around here! I do like the colors of this card. They are very bright and cheery!!! This card would be good for male or female and even a kids card!!! I can't believe that I am actually ahead in my birthday card making this year!!!! It's a first for me!!! If you'd like to learn the Shaker Box Technique just click here and you'll be taken to my post that has the directions. 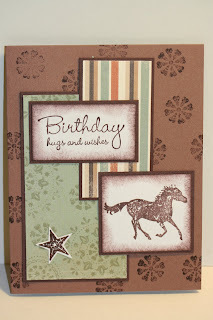 Here is my card for the Wednesday Sketch Challenge (SC) at SplitCoastStampers. This was a VERY fun layout. It was a bit of a challenge for me. I knew I wanted words in the #4 spot but the #3 spot cried for wording too. SO I opted to use a tiny cupcake there and I think it all worked. Anyway, back to the card. I used the Stampin' Up! "Crazy for Cupcakes" set. The words I did using the computer. The black background is the "Faux Alligator" technique. I think I posted it as "Faux Leather" on the SplitCoast site in my gallery!!! I will have to check and go back and change that. I just thought that technique would look good with these colors!! I LOVE doing that technique. It's fun to do and it's just amazing to see when it's done!! 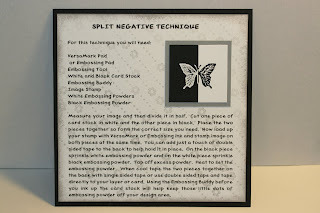 If you have time head on over to SplitCoastStampers and give their challenges a try. There's a new one every day!! Blog Candy WInner and a Confession!!! Before I post the winner of the Blog Candy I have to confess something here. Back then when my husband bought me flowers for Valentine's Day and for the 6 weeks of not smoking, I didn't remain a non-smoker. I was totally obsessed by the not smoking thing. It was HORRIBLE to say the least. I spent my days thinking of where I was going to go buy a pack of cigarettes. Then I thought about where I was going to go hide to smoke one. And where I was going to hide the cigarettes I bought. Oh not to mention getting the smell off my clothes. And don't forget the breath mints!!! It was SO overwhelming that I just started in again. But there is good news here. In 2001, on Christmas Eve I had my last cigarette!!! We were at my husband's niece's farm (he's got nieces and nephews close in age - he was a late in life child) and she had kittens. Well, there were around 8 of them and they were just over 4 months old. It was one of those very little snow on the ground extremely cold Minnesota winters. The kitties were all huddled together in a corner of the 1/4" finished garage. But there was this one kitten that was away from the group. He came near me and cried. Of course I picked him up. He looked like a round ball with a head, legs and a stick tail. His hair was drawn to tightly against his body to stay warm. The whole night I kept telling my husband I wanted that kitty. Even our son and my mother-in-law got in on it!! LOL Ok, here is where the not smoking came into play. I told him that if he let me have that kitty I would quit smoking. That is how bad I wanted that kitty!!!! SO on our way out the door that night he said to me "pick out the one you want." My eyes welled with tears, I glanced over at this beautiful fuzzy white and orange one and proceeded to pick up the grey stripped tabby that I fell in love with the minute I saw him. I was told that if I started smoking I had to give the kitty back. Well, it's been 7 years now and I have not had even a puff and I still have the kitty. He's the free kitty that has cost us a LOT of money in vet bills because of crystals in his bladder. Poor baby. He's a VERY nice cat and he was worth the "deal" I made to get him. I'd do it all over gain if I had to!!! "Last year, my husband (a pastor) had a board meeting on Valentine's Day...who thought that was a good idea? All of these men sitting at a meeting on Valentine's day! I would just like to stay home and either spoil my husband with back scratching and he spoil me with a foot rub." Anyway back to the Blog Candy, Lisa please email me with your snail mail address and I will get the package sent out to you. I always email back to let the winner know I got their address. If you do not hear back by 2 days it could be because of glitches somewhere along the way, they happen. 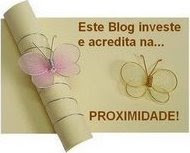 In that event just leave a comment on any post on my blog with the information. I will reject it so it's not published. Now for the rest of you who entered.... there is more Blog Candy to come. The next Blog Candy is the "Chatty Cathy" one. It's for reaching 1,000 posts!!! 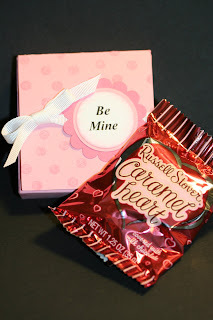 Then I think I am caught up on the blog candy for a little while. Thank you all for playing along and stay tuned for more!!! I was doing a bit of surfing in hopes of being inspired. I did get inspired and I did find a card that I just had to CASE (Copy And Study Everything). I was at Emily's site Stamping and Stuff and I saw this card there that I just had to have!!! Her card was not made using Stampin' Up! stamps so it is not completely copied. But to look at the two they are very close. 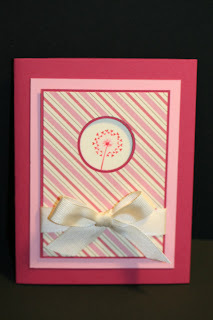 I used Pretty in Pink, Basic Black and Whisper White card stock. The little flower is from the Stampin' Up! set "Seeing Spots" and the words are from the "Short & Sweet" set. This is a very quick and easy card to make. I am really liking the "clean" look it has. These would be fun to make in a bundle and give as a gift!!! I just may have to do that. They were easy enough to do!! There's not a whole lot to talk about with this card. I do like the layout too. Just totally centered!! It has some layering but just plain and simple! I thought it was time for some altered art! It's been a long time since I've done that and when I was at Target they had these fun note paper holders. They had 3 different ones, the Toy Story, Monster's Inc. and one other one. The other one didn't seem to be as well put together as the other two so I passed on it. This is a very easy project to do. I think the most difficult part of it was taking apart the original note holder. To redo this all you do is take the paper out of the holder. Remove the holder. Take a piece of decorative paper. Here I used a half sheet of the Stampin' Up! "Candy Lane" paper. I taped the paper around the original holder. When taping you want to tape it in sections. I taped the lid first, then folded the paper to the back spine and taped it and then to the bottom. If you tape it all at once you will not be able to shut the lid. You must give it some easement so folding and taping as you go is the best way to d to it. Once I got the outside taped down I clipped a few edges so I could fold the ends over and tape them in place. I covered the inside with another piece of decorative paper. And as for the holder, well ... it was white and I just left it as it was. It d idn't distract from the decorative paper so why not use it as it is. I just used the Stick Strip tape to hold it in place. Then I took some copier paper and cut it to fit the box. I stamped a heart in the corner of the paper to pull the theme all together here!!! And the final touch was the ribbon on the outside. This also helps keep the lid shut! I decorated the outside with the Stampin' Up! "Love You Much" set. 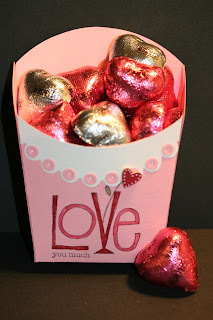 I added some hearts using some decorative papers and the 3 Hearts punch. I added a little rhinestone in the middle of the flower in the words "LOVE" and I added a heart on Dimensionals to the center of the word. And the final thing I added was a cute little button at the bottom next to the two punched hearts. It was a quick and simple altered item to make. I bought some extra note holders and plan on making some of these for the fall craft fairs. I had made these before using the snowman from Tags & More and I sold every one of them!! I was SO thrilled to see these for sale again so like I said, I bought some extra!!! Find something to alter and just have fun with it!!! 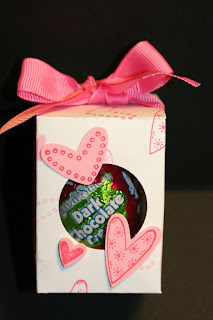 This is a box I made to hold one of those ever so famous Cadbury or Russell Stover candy eggs. This one happens to be a Russell Stover one because it was on sale!!! LOL During these tough times one still wants to give treats but needs to watch the pocketbook at the same time. Well, this is an easy way to accomplish both. 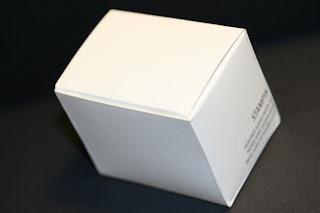 I got the box at the Super Delux Tuckbox Template Maker website by Craig P. Forbes. For this egg I used the measurements 1.75" in the width box, 2.5" in the height box and 1.75" in the depth box. There is a choice for the bottom of the box to either be tucked or glued. I did both and they are both the same so it really doesn't matter which one you pick. Once you enter in your measurements and submit it you will get a PDF file of your box. 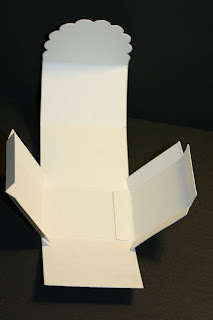 Open the PDF file and print out your box on card stock or whatever medium you are planning on using. I chose to use white card stock so I could stamp on it. I cut the box out and then stamped on it. When I was done stamping I scored the dotted lines. My images came from the Stampin' Up! set "Love You Much." I used a circle punch and added a window. To make my window I chose to punch it out on the side with the lid on it. I had to fold up the bottom flap and then punch through that and the panel. It won't show. But remember, doing it this way will cause the words on the inside to show through. But to hide them you just cut a scrap piece of card stock and tape or glue it in place. 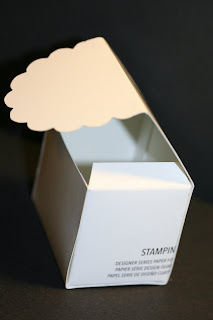 It will be great when I can get my hands on the new Stampin' Up! circle cutter!!! Then I put the box together. I glue my boxes because I don't feel that regular double sided tape holds well enough. The Stampin' Up! "Sticky Strip" may hold better but I prefer to glue. Now that little egg doesn't just sit in there all by itself with out moving around so you need to make a couple more things to help hold it in it's place. 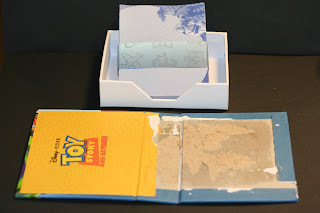 You will need to cut two pieces of card stock that match the inside of your box. Cut both of them 2-1/4" x 2-1/4". Score both of them at 2" on all four sides. Now look at your scored squares. See the little squares in each corner that the scoring created? You will need to cut those away, all 4 of them. Once they are cut fold your score lines. Now take a 1" punch and punch a hole in the center of one of the squares and take a 3/4" punch and punch a hole in the center of other square. When the square is folded on the score lines it created a platform. Place the square with the larger hole in the bottom of the box. 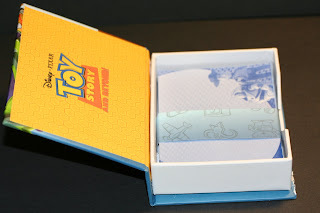 Make sure the edges that are folded are on the bottom of the box. Place the egg in the hole. Now take the square with the smaller hole and place it on top of the egg. Place it so the edges from folding are towards the top of the box. If you put it in the same direction as the bottom piece the edges will show through the window. Once in place you can fold the top of the flap in and tie the box shut!! I punched out a few hearts and added them to the front of the box. The tiny heart is on a Dimensional. It was fun, quick and easy to do too!! I'm off to shovel the driveway! We had some snow today and now that it's done snowing it's time to get it off the important parts of my yard!!! Actually I don't mind shoveling. It's just a part of winter and you all know how much I LOVE winter and snow and of course snowmen. And no, this was not snowman snow!!! SO for this one I am celebrating my 600,000 Hits. Yup, look at the counter. It's well beyond 600,000 now and there will be more candy for the 700,000!!! But for this one I am offering an adorable pink mail box for you to decorate and it will be to you in time for Valentine's Day too!! 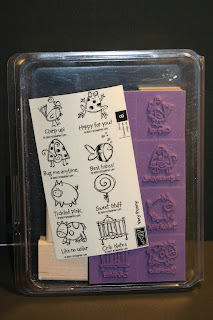 Plus there's two sets of Scrappy Cat clear stamps. One set is called "Birthday" and the other is "Friendship." The links on the words will take you to a website that has close up photos of the stamp sets. They are VERY nice sets. Brand new, still in the original packaging. And as usual I will be adding more items before it goes out in the mail!!! Now nothing is ever free!!! SO to be in the random drawing for this set you must leave a comment to this post only. Hmmm, what shall the comment theme be??? Well, since Valentine's Day is around the corner share with me something fun you do or have done on Valentine's Day. I will draw a name on Wednesday January 21st and post the winner along with my email address for that lucky person to contact me! The technique pages are all boxed up and emails went out to those on the list. If you did not get an email from me please email me and let me know. I am having trouble finding my information on Cheryl S. Please email me Cheryl! I do have a few extra sets left. I did make extra this time!!! You can contact me via email if you are interested. Be sure to put "technique pages" in the subject line. Click here to view the technique pages. All 40 are on this link. 20 pages are in a set. The first set of 20 is in the process of being redone. It's slow going with all the other things I have going on but they are getting done!!! This is such a fun, cute and unique technique. Oh and it's very simple too. It just takes a bit of time to do. Click on the photo for a closer view. Choose a piece of card stock that is bold enough to show the white gel pen marks. Stamp your images on the card stock using black StazOn ink. Doodle white details with the gel pen on and around your images using lines and dots. If the gel pen stops flowing just scribble on a piece of scratch paper until it starts again. This technique is very simple to do it just takes time depending on how much doodling you do. You can doodle as much or as little as you want but the more you doodle the more it looks like a bandanna. This is the final age in the second set of 20. I will be boxing the finished sets up and getting them ready for sale. Next week I will be contacting those who purchased the first set and the remaining sets will be available in the store. I will post that information when it's set up. 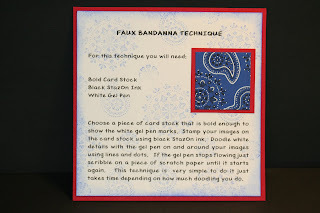 This card is made using the "Bandanna" Technique. Don't go looking for it on my blog, I have not posted it yet. But it will be the next and final page for the second set of 20 techniques. And I should have it ready to post later in the week. Then next week I have them all boxed up and ready to sell!!! Anyway, doesn't it really have that bandanna look to it??? I really like the end results of this technique. 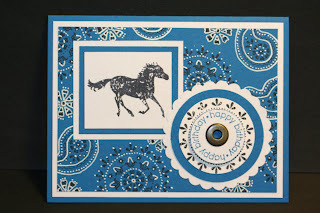 Here is my card for this weeks Sketch Challenge (SC) at SplitCoastStampers. It was a fun layout to play with. I did have a bit of a problem with the #4 corner pieces. I had some left over heart decorative paper I had gotten last year at Archivers. I thought I could use it up on this card. 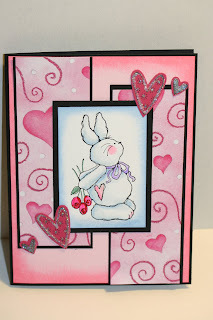 The stamp image is by Penny Black and it's called "Bunny Love." I colored the image in using the blender pen. I sponged the edges and it was ready to layer. I stamped the hearts using the Stampin' Up! "Love You Much" set and I used the Three Hearts punch to punch them out. I glued a little Dazzling Diamonds on the hearts after I had taped them in place. It's those hearts that are making me not like this card. I like the bunny but not on this card. The bunny will be for sale in my "No Yard Yard Sale" blog. I'm slowly (VERY slowly) thinning out my stamps. I just have way too many and I need the space more than I need the stamps!!! A Birthday Card for Someone Special! Here is a card I made for someone special. You know how I HATE to mention names on here. It's for my upline's upline Terri!!! I know how many candles will be on her cake this birthday but I won't tell!!! I always think of Terri when I use this decorative paper. When it first came out she demonstrated something with it and said how much she loved it. I like the paper too but the cherries were my least favorite out of the whole pack. SO when I heard it was her birthday I thought of that paper. For the layout I used the SplitCoastStampers Sketch Challenge #199 but I did modify it a little. I used the Stampin' Up! "Crazy for Cupcakes" set, the "Think Happy Thoughts" and a little incentive stamp for the tiny cupcake. I could have just used one from the tier of cupcakes but I didn't think of that until I was all done. 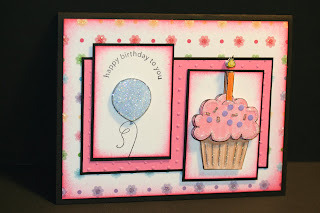 I had colored in the card with markers and on the little cup cakes I used the white Chunky Glitter. It added a nice touch to them. I added a few pieces of glitter to the flame of the candle but it doesn't show up in the photo. This was a fun card to make. I think they are easy to make when you have the layout figured out. I hope that Terri has a wonderful birthday!!! January is a GREAT month for a birthday!!! Mine was last Sunday and I had a wonderful time!!! 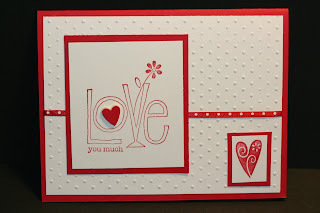 This "Love You Much" set by Stampin' Up! is SO much fun. 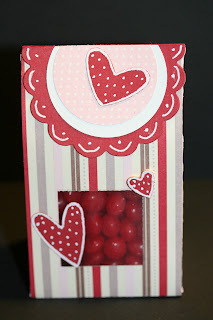 I'm having a lot of fun with it and with the "Candy Lane" decorative paper. This was the first card I made using the "Love you much" stamp. The other ones I've done I've used the hearts. And of course the hearts are on this card too. You can't have a Valentine's Day card without hearts on it!!! This was a VERY simple card to make. It was also a quick card to do too! There was no coloring at all on this card. I just stamped the image using Riding Hood Red and added the touch of bling! The background is made using the "Candy Lane decorative papers and those colors carried the card so it didn't need coloring! The hearts on the right catch your eye and the heat and the flower in the "Love" keep your eye moving around the card. It all fits together nicely. But for me, the best thing was that it was so quick and simple!!! Later in the week I will be posting Blog Candy. I need to get caught up on that too!! Oh and if anyone is interested, you are MORE than welcome to come over and enter receipts in my computer for taxes. I need them all done by the end of the month so I can file my sales tax with the state!!! UGH!!! I just learned how to use this program and now I have to enter in the entire year of receipts. It will get done. It HAS to!!!! I still find it difficult to create masculine birthday cards. I always want to add a bow, ribbon, glitter or even buttons and brads!!! Now this card I could have gotten by with one brad but I was being cheap and didn't want to pay the extra postage to send it through the mail. I was thinking that I now have all of the family birthdays covered for this month and then I remembered I need one more. Of course another masculine one for my brother-in-law. His birthday isn't until the end of the month but I'm going to make it this weekend or next week and be all caught up for the month!!! That will be a first for me! Ok, not a first but a first in a very long time!!! Ok, I'm off to clean up my worktables, I have no room left to work!!! There seems to be a problem where I had gotten the fry box template. I did go online there to find it and it was no longer there. Sorry I didn't check it out before I published that post. But don't despair I did find one at SplitCoastStampers. Just click here and you will be taken to the page that has the file for you to download the pattern. And then you can have some fun creating the boxes!!! It's endless what you can fill them with!!! Did you ever see a card and just HAD to have it but the only way you could have it was to CASE (Copy And Study Everything) it? Well, that is exactly what happened here. I was at Mudmaven Designs Blog and she had this card. I copied it pretty close to hers. There's a few subtle differences but for the most part it's a copy!!! I LOVE to CASE when I can. It gives my brain a break!!! It's rare that I actually copy a card. I start out with someone elses idea and begin to copy and then the next thing I know I've designed a totally different card. I mean SO different that if you were to hold the two up together you'd look at me and ask me "how did you get that card from the original?" Most of the time they never look a bit like the original!!! I know that's a good thing!!! But I started out to CASE the card!!! And this time I did!!! Mudmaven did a wonderful job on the card. I loved the colors and especially the layout. I'm SO into layouts of cards. That is why I LOVE to participate in the Wednesday Sketch Challenge at SplitCoastStampers. It's always fun to have a new and different layout. As I work with these layouts I find that I have stamps that actually fit in their focal pieces. Most of the time when I do participate I just measure that main part of the card and find a stamp I own that fits it and go from there. Back to this card. 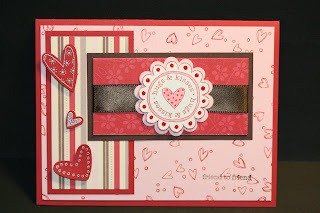 The background on the Pink Pirouette card stock is the heart stamp from the Stampin' Up! set "Sprinkles." That is another little background set I LOVE to use. The hearts were stamped in Riding Hood Red ink. The three hearts were stamped on Riding Hood Red card stock using Whisper White ink and then embossed with clear embossing powder. Then they were punched out using the new 3 hearts punch. That is such a fun punch to play with. Now the decorative paper on the left side of the card is different from Mudmaven's card. And my ribbon is different. The words on the bottom right are different and the scallop is different. I had stamped the image on white card stock and used the scallop punch and punched it out. I didn't have a larger scallop to go behind it so I had to punch a scallop out of the pink card stock and then I ended up taking the white piece and cutting around the edges by hand. It only took a few minutes so it wasn't bad. But if I had to do them for a swap I would rethink the cutting!!! The scalloped piece was colored using Pretty in Pink ink and the dots were colored in Real Red. It seems to blend in enough with the Riding Hood Red when used in small areas. Then Crystal Effects was dotted on each one. I did use a tooth pick for that. And finally the scallop and hearts were set in place with Dimensionals. Even though my card is a bit different I do like it!!! 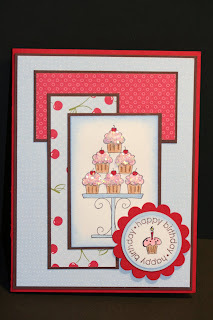 I am really enjoying the in colors and the Candy Lane decorative papers. It really helps to make Valentine's Day cards a simple task!!! I was SO thrilled today when the doorbell rang. It was the mail carrier bringing a package to the door that was too big for the mail box. Along with that he brought the rest of the mail so I didn't even have to go out in the cold today to get the mail!!! Lucky me!!! And what was in that oversized package??? It was a new Sizzix Bigz Die Cut!!! A fry box die cut!!! I LOVE making the fry boxes but after a few of them my hands are tired from cutting them out. Well, how perfect is this??? Just run your card stock through the Big Shot and with the die and you have an instant fry box!!! I LOVE it. I had gotten it at Oh My Crafts. SO I just had to play with it. After I cut it out I wanted to decorate it a bit. SO I took a piece of white card stock and ran it through the fry box die again but only caught the front part of the box. Then I took the Stampin' Up! Scallop die cut and lined up that front piece so it would cut evenly across the scallops. Once that was done I took an 1/8" paper punch and punched holes at the scallops. I marked each spot with a pencil before I punched so I could get them fairly even. I thought it could use a bit more color so I made some Faux Eyelets (that technique can be found here.) I glued them in place. I stamped the image on the front of the fry box and colored it in with Ruby Red and Regal Rose markers. I used Mellow Moss for the leaf and stem. Then I attached the white piece to the front of the fry box. It did cover up the flower that was on the stamp image but that was ok because I was planning on covering it with a heart anyway. I took another one of those foam hearts that I have in abundance and stuck it in place where the flower was. Then I punched out a heart using Riding Hood Red and stuck it on the foam heart. I then took my gel pen and added some dots around the heart and on the inside of the Faux Eyelets. I was thinking about adding some glitter to the words but realized I needed to cook dinner here soon and didn't want glitter in the air or on me and obviously I didn't want it in the food!! It's SO dry in our house right now and everything seems to cling. Oh and let's not mention the static!!! The poor cats hate to have me pet them!!! LOL I even got a shock from the running water. I turned the water on and put my hand under it and got a shock. UNREAL!!!! Once the box was done I taped it together. I do recommend glue instead of tape. When I added the candy I found that the tape was pulling away from the sides. Not a good thing if you want the box to stay together!! Fill it with your favorite candies or the favorite candies of a friend and give it as a gift! It was a lot of fun to make!! And I plan on making more too!!! If you'd like to make a fry box and don't have the die cut you can find a pattern for one here at Mirkwood Designs. There's a LOT of fun patterns there. Be prepared to spend some time there looking at all the fun patterns and then be prepared for your mind to fill with fun ideas to use the patterns with!!! It's very inspiring there!!! 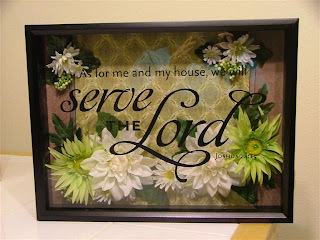 Here is a BEAUTIFUL shadow frame that Kristi made. I just LOVE it and I asked her if I could post it on my blog to share it with you all. Isn't it just fabulous??? It makes me want to redo mine with these words instead of the seasons one. Which by the way got stuck on crooked. If I do redo it I am going to have some help. Right Sue????? *winks* I'll somehow sucker her into helping me with it. Actually I don't have to sucker her in, she's such a sweet person that she will be more than happy to help. Don't you love having people like that in your life??? I just LOVE the layering of the papers in the background and then the flowers just seem to just burst forth. It's absolutely stunning!! Thank you Kristi for allowing me to post your beautiful work on my blog! This is page #19!!! One more to go and I can release them for sale!!! This is a VERY fun and interesting technique. It is also a simple one to do too! Measure your image and then divide it in half. 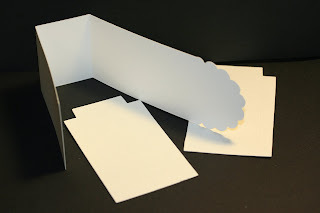 Cut one piece of card stock in white and the other piece in black. Place the two pieces together so form the correct size you need. Now load up your stamp with VersaMark or Embossing ink and stamp image on both pieces at the same time. You can add just a touch of double sided tape to the back to help hold it in place. On the black piece sprinkle white embossing powder and on the white piece sprinkle black embossing powder. Tap off excess powder. Heat to set the embossing powder. When cool tape the two pieces together on the back with single sided tape or use double sided tape and tape directly to your layer or card. Using the Embossing Buddy before you ink up the card stock will help keep those little dots of embossing powder off your design area. There is no limit to the fun you can have using this technique. You can even use different colors of embossing powders too!! I have one more page left and this set of 20 pages will be completed. I will be emailing those who had purchased the first set and the remainder of this set will be available in my online store. I will create a post letting you all know when it's available. I am still working on recreating the first set of 20 pages and I will announce when they are finished too! 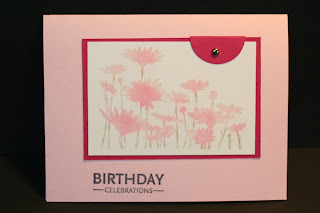 Here is my card for the Sketch Challenge over at SplitCoastStampers. This one was fun. 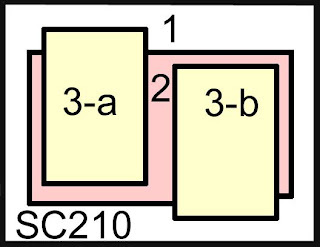 I did find it to be quite a challenge because of those two boxes 3-a & 3-b. They threw me for a while. I wasn't sure if I wanted to have the same image in each box or if I wanted to mix it up with words and an image or just decorative paper and an image. Well, after some thought this is what I came up with. Two different images and one of the images has wording!! Getting the best of both worlds here!!! The adorable background paper is some decorative paper I had gotten at Michael's in one of those tablet things. It's a glitter page collection. I thought these flowers looked festive and were perfect for this theme. The cupcake and balloon are layered and have Dimensionals under them. The cupcake has three layers. The candle flame also has three layers. I added some Dazzling Diamonds to help the stamped images pop more. For the sprinkles on the cupcake I added some Dazzling Diamonds and I took a 1/8" paper punch and punched out a few dots and glued them in place. It was just what the cupcake top needed!!! WOW, I almost didn't get this posted in time. It was such a busy day today!!! I hate those days that the minute your feet hit the floor in the morning you're constantly on the move!!! And today was exactly like that. A million things to do and not enough time in the day to do them all. I still have a few things left to do but I'm such a night owl that I know I will get them done before I go to bed. I decided to take a few minutes out and make another Valentine's Day card. 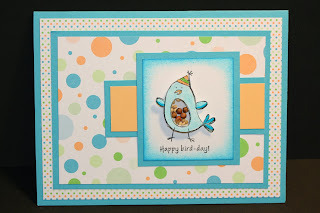 For this card I used the Stampin' Up! "A Happy Heart" set. There are a few other stamps in that set. I am going to take some of them out and use them too!!! Though I REALLY do LOVE this heart dandelion!! My card stock is Riding Hood Red and Pink Pirouette . I used a few scraps of the Candy Lane decorative paper. It's such pretty and fun paper. I know I'm going to have to order another package of it when it's available. For the image I just used the "Direct to Rubber" technique where I just colored on the rubber with markers. When I was done I huffed on it. The steam from my breath moistens the ink and it's ready to use. Then I just made layers and put everything on the Pink Pirouette that I ran through the Dotted Swiss Cuttlebug folder. I tied some Pink Pirouette 5/8" ribbon around the top layer and then I taped the pieces in place. It's ok. Not one of my better pieces of work but for a quick card it's ok!! I can not begin to tell you how fun this bag die cut is. I had gotten in online before Christmas. I used it to make some bags to put some Christmas gifts in for my stampers that came to my home in December. I used the decorative paper from the Stampin' Up! "Candy Lane" pack. I LOVE that paper!!! The die cuts the paper out in 3 pieces. It's a long die like the basket one that Stampin' Up! sells. When I saw it online I knew I had to have it. I knew I would get a LOT of use out of it. I believe I got it at Oh My Crafts, just click on the Sizzix link at the left sidebar and in the next window you'll find the Bigz XL dies. Have fun shopping there!!! There isn't a big selection of the bigger dies but they are still a new concept so I think it will be a matter of time before there are more choices!!! To make the flap I just took a piece of Riding Hood Red and put it on the die cut and cut only the flap piece. I punched out a couple of different size circles and added them to the top of that flap. I decorated the edges of the Riding Hood Red piece using the white gel pen. Before I had assembled the bag I took my square punch and made the window. I glued on a piece of acetate, just big enough to cover the window. Then I assembled the bag. I took the Red Hots and poured some in a small food save baggie and sealed it shut. I slipped that inside the bag. The candy shows through the window, pretty fun, huh?? This was actually a pretty quick bag to make since I didn't have to do a bit of cutting by hand!!! It sure saved me a lot of time. I have some ideas of using this for craft fair items come fall. I'll be sure to share them with you as I create them!! My younger sister is going to be having surgery on the 12th and I thought I would make her a get well card. I can't believe I am actually going to be on time with cards this month. I have to make a masculine birthday card for this month and I am set!!! That will be a first!!! I hope the whole year can be like that in my card department!!! 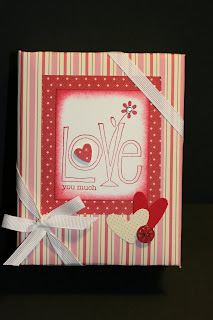 For this card I used decorative papers, plus I used the envelope die cut!!! I LOVE that die cut!!! 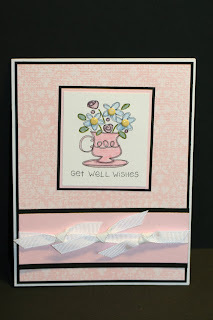 I did have trouble finding some "get well" wording so I ended up using the Stampin' Up! "Curvy Verse" for the little pull out part in the envelope. And on the scallop punch I used my computer to type the words and I used the Red (R) Blue (B) Green (G) code for the color because I wanted it to match. It looks like I stamped the words because they really do match!!! I'm posting a little late tonight. I had a ton of things going on today that I NEEDED to finish up before I could go down in my workroom and make a card. My uncle died on the 2nd and I wanted to send my aunt a Sympathy card. 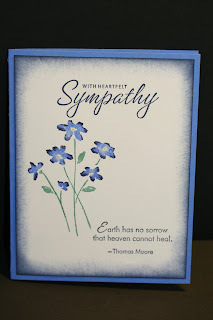 I find masculine cards are difficult enough but to make a masculine Sympathy card was quite a challenge too. I figured I'd stick with blues. Flowers.... well, it was the only sympathy set I had. Plus a car or train hardly seemed appropriate. Had REALLY he been heavily into cars or trains it may have worked. SO I stuck with what I had and came up with a fairly masculine card. Hey I never clean up my stuff, that would ruin my crafting counter. I still have cards I started a while ago and haven't finished yet. Laurie please email me with your snail mail address and I will send the stamp set to you! What a fun way to start off your New Year!!! Please contact me by Wednesday January 7th. If I do not hear from Laurie by then I will re-post the Blog Candy. Thank you all for playing along. After the winner has contacted me I will post more Blog Candy. There is still several of them I did not get to because Christmas was such a busy time and besides, have you ever had to wait in those LONG lines at the post office that time of the year??? UGH!!! I brought my little radio with me and popped in the ear buds and just listened to Christmas music while I stood in line. Something to do while I was waiting. Check back for more candy!! I just NEVER get tired of using this layout. It's one of my favorite. Now in using this layout along with that BIG ole bow on there just eliminated it from the choices of cards I was going to make for hubby. Adding that big bow made it a girly card!!! This was a VERY simple card to make too. I used the new Stampin' Up! "Candy Lane" decorative paper. I turned the stripes to the side for a better effect. Then I punched the hole. Behind the decorative paper is a piece of Ruby Red layered. After that layer I added the image using Dimensionals and Dimensionals were also added to the back of the Ruby Red piece so it would stand up on top of the card. Plus it makes the card lay nicer because of the bow. The layer the Ruby Red pieces is on is Pretty in Pink and that is affixed to the main card which is Ruby Red. The image is from the "A Happy Heart" set. After taping off the words and the hearts blowing in the breeze I stamped the image in Pretty in Pink ink and then took the Ruby Red marker and colored in the hearts, stem, center and just outside the center of the "flower." I huffed on it and stamped the image on Very Vanilla card stock. See, I told you it was simple. Because I didn't add any wording on the outside this card could be used for several other events. It's just a sweet looking card and again I can't tell you how much I LOVE using this layout!!! SO what is the theme for the comment....... Hmmmm...... Let's go with a stamping theme here. When you are done stamping for the day is your worktable all cleaned up, is everything put back where it belongs?? So leave me a comment to this post and don't forget to check back on Saturday afternoon. I'll draw a name in the morning. This way it gives the winner a couple of days to reply back and I can get the package out in the mail next week when I am out and about!